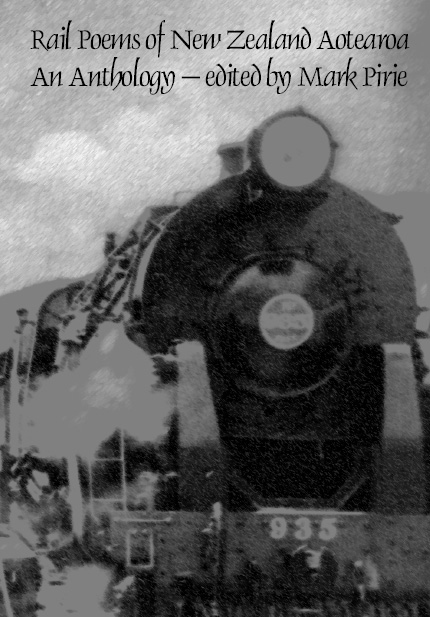 The railway has been a dominant presence in New Zealand life for a century, connecting freight and people. In this new collection of rail poems, editor Mark Pirie presents a fresh and vibrant journey through many facets of the railway and explores its significance in our daily lives. Contributors: Anon, Fleur Adcock, Marilyn Duckworth, Michael O’Leary, F W N Wright, Kim Eggleston, Louis Johnson, Jan Kemp, Fiona Kidman, Ron Riddell, Simon Williamson, Will Lawson, Jean Hamilton Lennox, Roger Wrighton, Hugh Isdale, Stephen Oliver, Peter Olds, M K Joseph, Rhys Pasley, Mark Pirie, Alistair Paterson and Peter Cape. Give us the railroads, Vogel! With private jobs at their backs. Without them she will fall. Over New Zealand’s broad breast. Penned in 1874, probably in a newspaper, recording controversy over Prime Minister Julius Vogel’s decision to build a nationwide railway. This book is a special non-profit limited edition of 50 copies published to coincide with the launch the Poetry Archive of NZ Aotearoa in association with the Earl of Seacliff Art Workshop.